The number of amazing websites and blogs that are online now is incredible. It is impossible to keep up with them all. Here I provide a list of websites that I have found useful for my personal teaching. They are split into sections, which you can jump to using the links below. I hope they are useful! A collection of interactive maths resources which are useful in the classroom. There are some great games, worksheet options and some fantastic extras for use in the classroom. This site is brought to you by the UK's leading Maths Software Developers. Over 10,000 randomised maths questions which can be used to set online maths homework, create maths worksheets, IWB resources or online video assessments. Plus you can get a one month's free Trial! This project has been developed and is run by Richard Noble (@mathstermaths). This is an excellent blog maintaned by Jo Morgan (@mathsjem). The highlights are: the fantastic Maths Gems, which take 5 ideas a week from the twittersphere; the topics in depth collection; and the topic special posts. Mr Barton has finally set up a blog to accompany his amazing site. With articles from the TES Maths Panel on the Top 10 TES Maths Resources, the Resource of the Week and the Resource of the Day, the new Diagnostic Question of the Week and the Probing Maths Questions, I would heartily recommend keeping an eye on this blog as it updates. A fantastic blog maintained and updated regularly by Colleen Young (@ColleenYoung). There are hundreds of fantastic ideas she has picked up, and these are seamlessly sorted into fantastic sections. An absolute treasure trove of ideas and inspiration, and well worth a good look. Another great blog with loads of ideas for use in the classroom, set up by Paul Collins (@mrprcollins). Definitely worth checking regularly as there are loads of updates. An awesome blog with some really amazing ideas. From the author of two also amazing books "100 Things Awesome Teachers Do" and "The Magic of Pineapples". William Enemy (@Maths_Master) runs this blog. A blog from across the pond run by Sarah Carter (@mathequalslove), it is regularly updated with a variety of resources and ideas that Sarah has tried in her classroom. I particularly like the printables and interactive notebook pages that Sarah makes. They look great, and really help students organise their thought. A great blog with some fantastic ideas run by Mo Ladak (@MathedUp!). Originally it had a high focus on A-Level resources, but recently there has been a huge focus on GCSE resources, the most popular of which is probably the GCSE Maths Takeaway. Not strictly a blog, but the weekly #mathscpdchat on twitter is an excellent way to engage in maths education. All the previous chats are recorded on the NCETM site, but the real power of this is to get actively involved in the conversation. This chat takes place weekly on Tuesdays at 8pm UK time. A huge selection of problems and interactive resources for all ability and age ranges. A highlight is the Maths Problem of the week for me, which makes an excellent starter to lessons. They also have the hugely helpful Curriculum Mapping Documents, which provide the entire National Framework, with links to appropriate activities for each section and year. There is also a large selection of freely downloadable posters of popular problems for display in your classroom. The UKMT is most famous for running the various Maths Challenges throughout the year. The individual challenges pose slightly different types of questions to pupils, forcing them to think outside the box. Although the competition itself is great for the pupils, using the past papers to pick questions as starters can really get them thinking. The group rounds are an amazing day out for the selected few who can go, but why stop there? Run a mini challenge throughout a year group or in a lesson to get the blood pumping. Some of the resources are available free of charge, but the older materials may need to be ordered (but they are worth the money). One of the best hidden gems of this website is the gateway where you can find all the previous papers with each question given individually, so you can copy and paste it into a powerpoint as a starter (the solutions are also on there, as a separate image). I have designed a Random UKMT Question Generator which makes use of these images. The mentoring pages are also excellent for pushing your best mathematicians. Numberphile (@numberphile) is a website full of interesting short videos on a whole range of aspects of maths. With guest mathematicians from across the country (@jamesgrime and @standupmaths), no area of maths is left out, and they can make fascinating starters to lessons. They can also be used to stimulate students to look a bit deeper in to this amazing subject. It is also well worth having a look at the Numberphile YouTube channel. An American website filled with simple rich problems, all of which are given as multiple choice. Great for starters or extension questions, each problem provides the answer and a description after an attempt at it. As Mr Barton suggests in his Web Whizz video, they can make a great computer lesson, as it records your correct answers for that session. A great site with some fantastic challenging questions set up and maintained by Ed Southall (@solvemymaths). 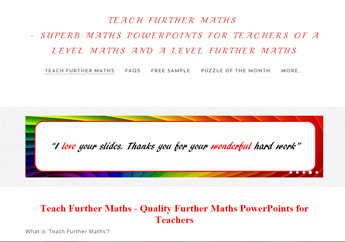 There are several sections to the site including the home of the challenges, a selected resource of the day, a Maths GIF of the Day which are some excellent animations to demonstrate mathematical concepts, and of course the blog which is always a fantastic read. This website has a fantastic collection of puzzles and problems to probe the thinking of your students. There is a searchable database to find puzzles on particular topics, and four levels of difficulty. Handily, there are also pdf files of the puzzles for each level (which come with solutions). The problems on Open Middle are organised by age group and area of maths, based on the US system. They mostly follow a similar structure, where students have to input digits in the boxes to make a statement true. An excellent way for students to practice skills whilst solving an engaging problem. Put your students in a pickle. That's the tagline for this excellent site. It contains some excellent puzzles for students to ponder and pickle over. Produced by Gordon Hamilton (also known as Dr Pickle), these problems are designed to challenge students to think, make mistakes and learn from these. I haven't used much from here yet, but I am looking forward to getting more out of this site in the future. This website is full of explanations of topics throughout the maths curriculum, but in my opinion the best bit are the challenges and the quizzes. Carefully designed questions which are challenging and make great extension questions for the higher ability. Covers the whole age range as well. I enjoy testing my own skills at home on this website. Basic usage is free, but for a small price you get even more challenges, and solutions to all the problems as well. Puzzlebomb is a monthly puzzle compendium. With over 50 issues, there are loads of puzzles to use in class, or for you to try yourself. Full answers also provided in case you can't quite work it out! A set of "Rich Starting Points" from Jonny Griffiths at the University of Cambridge, these are great to get A-Level students thinking. Can be downloaded as a package, or used online. A lovely selection of challenging problems to stretch the highest ability in the class. A large collection of puzzles, many of which have interactive elements to them. This page in particular has all the ones based on the famous Martin Gardner. This blog is full of amazing puzzles to give your students. There is a new puzzle every day, of varying difficulties, and they are suitable for all age ranges. The creator, Paul Godding (@7puzzle), comes up with new types of puzzles all the time, but have a look through the old puzzles to find some real gems as well. I use one of these as a starter almost every day in my lessons, they are absolutely fantastic. Vi Hart (@vihartvihart) is a self proclaimed "mathemusician". She has made many videos on a huge variety of interesting areas of mathematics, from mathematical food to her infamous mathematical doodling series. There is also her blog which contains lots of new videos regularly. These videos can make excellent starters to lessons, or plenaries, and are mainly aimed at the older students, though there are some which will be of interest to some younger ones. A website full of downloadable resources for teaching all areas of the mathematics curriculum designed and updated by the fantastic Mr Barton (@mrbartonmaths and @TESMaths). Areas of his site which I find are of particular use are: the incredible topic resources section; the fantastic selection of Special Resources; his Autograph Activities; the newly developed Wolfram Alpha Widgets; the CIMT MEP pack. A new highlight is the GCSE Maths Takeaway page which has questions, videos, answers, Diagnostic Question Quiz and a Mathster Quiz for 111 maths topics. This site is maintaned by Jo Morgan (@mathsjem). The selection of resources is amazing, collecting resurces from across the internet for teaching most of the curriculum from age 11 to 18. A recent extension of the site is the superb PRET Homework collection which is rapidly growing with contributions from a large variety of teachers. The MEDIAN blog is set up by Don Steward, and he populates it with amazing rich problems, which are uploaded as simple images to save and paste in whatever format you want them. He also has a new GCSE version of his blog which focusses on practice questions in preparation for exams. This website contains a huge selection of video resources for the GCSE course all maintained by Mr Corbett (@Corbettmaths). Even better, each video comes with a worksheet of practice questions as well, and he is currently developing a set of textbook exercises for each as well. Other areas of the site also include the 5-a-day which are worksheets with 5 questions on, one for each day of the year and the new Corbett's Conundrums which are a puzzle for each day of the year. One of those sites where you know if you find it here, then it will be excellent. Miss B (also known as Danielle Bartram @MissBsResources) has a section of her website dedicated to amazing teaching resources which are always very aestheticaly pleasing. She also has a blog and her Interactive Seating Plan available, both of which are definitely worth checking out. A website set up by the University of Cambridge in conjunction with the Department for Education, spawning from the Cambridge Mathematics Education Project. Underground Maths (@UndergroundMath) some amazing resources for teaching A-Level, with deep thinking involved in the overarching questions. Still in its infancy, I am looking forward to seeing this develop further. No longer funded, there is no new content being added, but what is already there is fantastic. A fantastic website with a large collection of Excel spreadsheets that generate random worksheets. They always have lots of options to choose from, and you can print them out as a worksheet to give to your students. You can also print one out with the answers as well, to mark it with. Each worksheet has the option to "Generate new worksheet" which randomly chooses numbers to fit with the options chosen, so you can creat as many different worksheets as you like. Excellent when a group really needs to practise a specific topic to get the hang of it. All managed by David Watkins (@dynamicmaths). This is a fantastic site that is still growing. You can generate a worksheet of questions on a variety of topics, or include a few different topics. But there is also a large collection of virtual manipulatives; fluency activities; and tools to make a Maths teacher's life easier. This comes from Jonathan Hall (@StudyMaths), the same person that brings us StudyMaths, FlashMaths and FormTimeIdeas. This site is "a box of extras" for mathematics teachers, and it certainly lives up to that. They have a large selection of different materials for various topics across the GCSE curriculum. There are interactive Bingo games, where you print off the bingo cards, and have 4 different games to choose from for each topic (using the same cards). They also have some settlers, which are designed to be on the desks as students come in, where they shade the answers to the questions, and those that remain add to a target number (for self checking). Finally they have a brilliant selection of Treasure Hunt activities for displaying around the room, each with 20 questions in, and the answers! A really fantastic set of resources. Recently this has become a subscription service, but for the small cost for the whole school, it is definitely worth it! This site has been set up by Ben Cooper (@bcoops_online), and he has been lovely enough to share a wide selection of his fantastic resources. There is a huge range of different materials, from powerpoint lessons (which are incredibly detailed), to match card activities, SEN schemes of work to differentiated worksheets, every resource is easily usable as it is. Set up by Manoj Mistry (@MrMistryMaths), this site contains absolutely amazing full lesson resources for loads of topics throughout the KS3 and KS4 age range. Each lesson has a fantastic fully worked starter, and all examples are worked and animated perfectly. There are also always plenaries, and often activities for use in the bulk of the lesson too. Definitely worth checking out. Suffolk Maths is a site created and maintained by Mark Greenaway (@suffolkmaths). It has a huge selection of information and resources all available for free. The Problem Solving and Games & Projects sections are some of my favourites, but the whole site is definitely worth checking out. A fairly new website run by Grant (@AccessMaths) which he is populating with the high quality resources that he is making as he begins his career in teaching. What is there is fantastic, and I am sure there is plenty more to come. Run by Andrew Chambers, a maths teachers with years of experience teaching in international settings, this site contains resources and ideas for exploration in the ToK side of things for IB Maths. They are all off-curriculum, and more interesting uses of maths in the real world (or not), and provide excellent enrichment opportunities for any Post-16 qualification. A website with lots of resources in different categories, that is run by Stephen Bodman (@stephenbodman). My favourite activities are the amazing excel random question sheets and the Algebra Countdown. A project run by the Shell Center for Mathematical Education at the University of Nottingham in conjunction with the University of California at Berkeley. There is a variety of resources on this site for addressing and developing the key skills in Mathematical Thinking. There are full lessons with detailed lesson plans and how to best utilise the formative assessment part of these lessons, and also a selection of standalone tasks. They all relate to the 8 standards that the project has identified as the key principles in Mathematics Education. Definitely worth a look! The TES (@tesResources) has a huge collection of materials to download that other teachers have uploaded. You will have to register with them to download or upload materials, but this only takes a couple of minutes, and it is definitely worth it. The Dr Frost Maths site contains a wealth of excellent resources which are designed for high attaining students. But there is an amazing online platform for creating assignments, and setting homework. All set up by Jamie Frost (@DrFrostMaths). This website is absolutely fantastic for GCSE and A-Level. It is jammed full of videos explaining how to do a huge variety of the topics in each syllabus. And if this wasn't enough, then there are also printable notes on each topic, as well as a set of questions to practice the topic, with full written out solutions. Whether you are trying a "flipped classroom" approach, or just looking for something to help out your students in the run up to exams, this website is a must. Colin Hegarty (@hegartymaths) has produced a selection of videos explaining a series of topics through GCSE and A-Level maths. These are great to point students towards who need a little extra explanation as they can watch them in their own time. Brian Arnold (@Mrarnoldsmaths) also contributes to the upkeep of this fantastic site by making videos. They also have a YouTube page. Diagnostic Questions are simple multiple choice questions where each of the possible incorrect answers reveals a key misconception. With these, in a matter of a couple of minutes, you can identify not only who hasn't understood a concept, but also what misconception they have. You can now print a pdf of a set of questions, allowing you to set them as a homework and to justify their choices. The site is brought to us by the fantastic Mr Barton (@MathsDQs) and Simon Woodhead (@getdiagnostics). The idea of varied questions was brought to the forefront by Craig Barton, and he has now set up a website to share examples of these types of sets of questions. There are four different types of activity on the site, which you can read all about here, but they all work on the principles of variation theory. The idea is that by changing only one thing at a time, students can develop a better sense of what is going on. A simple idea, Maths Venns has a large selection of Venn Diagram tasks where students are to place something in each of the regions of the diagram, if possible. These are a great way to get students thinking in more depth about the properties of the mathematical ideas. A goal free problem is one where there is no fixed end point to the problem. Rather, students just have to find out all they can. Based on an idea from Cognitive Load Theory, this will help students to develop their mathematical thinking without being constrained to an answer. SSDD Problems are those that look similar on the surface, but have different underlying mathematical properties. This is designed to help students develop expertise in Mathematics, as it is experts who are able to see the deep structure of problems, and look past the surface features. Numeracy Ninjas is a free set of resources for improving students numeracy skills. The idea is to improve the basics in students by doing short regular practice sessions (5 minutes each lesson, or once a week), in order to make them more confident at maths. It is a great programme, especially for those who think of themselves as weak at maths, and comes with all the necessary resources to run the programme. This includes the question sheets (enough for one each day), answers, a spreadsheet to record marks, a suggested way to run the sessions, and even rewards and prizes. ﻿A new website from Darren Carter (@MrCarterMaths) with one purpose: it creates sets of differentiated (Bronze, Silver, Gold) questions on a variety of topics. Great for use as starters or worksheets, these allow students to start where they feel comfortable. With more on the way all the time, this is a site to keep a close eye on. This is a great blog giving with each post giving two options for students to choose between, and most importantly, justify their decisions. Most posts also include helpful information for teachers to use as hints or for discussion after the students have justified themselves. Run by @Jstevens009. A great site with a selection of nearly 200 objects which prompt some form of estimation. Designed to help build a sense of numbers in students, these could be used as fantastic starters. There is even a handout to give to students to help prompt them in their estimations. A lovely idea, where each image shows four related items (Shapes, Numbers, Graphs), and students must discuss which one does not belong. All are designed so that there are multiple possible answers, so the emphasis is on the discussion rather than the answer. Website put together by Mary Bourassa (@MaryBourassa). This beautiful website is run by Clarissa Grandi (@c0mplexnumber) who is very keen on origami and how it can be used in the maths classroom. This site has a lovely selection of maths in art activities and displays which can be used to brighten any room. A blog run by Iva Sallay populated with fantastic puzzles based on finding factors and knowing your basic multiplication facts. Six new puzzles are released each week, of varying levels of difficulty (which are all explained here). There are already over 250 puzzles to get you going, and they are great starter activities for the classroom. A collection of 111 worksheets organised into topics. All questions are from past papers, so they are great as revision tasks. Intended to be for students to access themselves to practice the topics they want/need. I have a little bit of a soft spot for this website as it is run by one of my lecturers from when I was at University, but none-the-less, if you need to know something about the History of Maths, this is the place to look. With detailed biographies of all the famous (and not so famous) mathematicians, as well as the history of some areas of the subject, it is an invaluable resource for a cross-curricular project. ﻿Euclid's Elements may be a bit outdated as the textbook for teaching mathematical concepts, but it is still of vital mathematical and historical importance, behind only the Bible. It was used as THE textbook for school maths for thousands of years, and in it Euclid set out the structure for mathematical proof that is still used today. This site has the whole book beautifully set out, with interactive Java applets accompanying each Proposition. A site dedicated to giving the earliest known uses of mathematical words, and where they came from. Useful when students ask why we use a particular word! Mathsisfun is a free and fun site that offers multiple ways of understanding concepts ranging from algebra to geometry. Supplemented with games and animations, the site has proven useful for students of any and every age. Another simple but addicitive game, this one is aimed at developping students sense of number and estimation, particularly around calculations and working out if an answer is sensible. Developed by Hugh Small. A unique site that will tell you some of the interesting properties of any given number. Transum have created a set of 366 starters to use, one for each day of the year. Some are fairly routine, but keep your eyes out for the truly exceptional ones (you can also search by topic if you need something specific). The main focus of the CIMT was the MEP project, but they have produced a variety of other resources available for download from their website. A collection of computer based resources, and tutorials set up and run by Douglas Butler (@douglasbutler1). There is also a fantastic blog on the site, and through a close working relationship with Autograph, a large number of resources for its effective use. The TSM yearly conference is also a must for anyone interested in using technology in the classroom. Highlights include the links page and the For the Busy Teacher section. A great blog that has many guest bloggers from around the world sharing ideas. Lots of great ideas, worth checking regularly. A brilliant new site with some excellent interactive resources and full explanations. Set up an run by Will Feavyour (@NextLevelMaths), who is a current undergraduate studying maths. Regularly updated, and worth keeping an eye on! The ATM (@ATMMathematics) is a professional body for teachers of maths. As a full member (paid subscription) you get access to a wealth of resources and their very good journal Mathematics Teaching. However, they also have some freely available resources, as well as a vast array of books for sale. A selection of excellent project based activities using examples from the real world to engage the students. Designed in Yorkshire and Humberside, they worked alongside local industry to create these resources, which create excellent opportunities to hit the Functional Skills boxes. MyTutor Web have put together this great article on tips and tricks to help students make productive use of their revision time. Another collection of facts about any given number, including how it is written in different bases. Create pdf worksheets on various topics, which you can customise to suit your needs. Even better? There is a section of Mathematical puzzles that are great to get those brains in gear in an afternoon, or towards the end of a term. A site filled with premade worksheets on a large variety of topics. All come with answers, and are well designed. A collection of 40 mathematical activities which bridge the gap between A-Level and University. Developped by Jonny Griffiths. The National STEM Centre at the University of York has a huge collection of older materials, that they are turning into electronic resources. Have a look through their elibrary, and you might find some of the resources that were used when you learnt maths! A selection of Investigations, Games and other resources available for free download. Some of my favourites include the Countdown game, and the Mathionnaire. A selection of 160 excellent mathematical puzzles. Each one comes with a hint and a full solution. These can make excellent starters. I wouldn't go into a classroom that doesn't have Autograph installed. It is an absolutely fantastic piece of software for graphing, working with transformations, and looking at statistical diagrams. There are so many ideas that you can implement for its use, some of which are found on this site, or at TSM Maths. If you don't have it at your school, then I would very strongly recommend it. GeoGebra is a freeware (that means it is totally free to use, share, edit, etc) designed by mathematics teachers. It has a very strong graphing element, but really stands out when used for geometry. It is unique among the graphing softwares in that you can easily relate the algebra with the graph with a spreadsheet. The newest update also includes a great 3D interface, but the best thing about GeoGebra over other graphing software is that you can add almost anything you can think of with a little bit of scripting (if you know anything about that). It also has a huge amount of uploaded materials from other teachers on GeoGebraTube. Available for all operating systems, and also on tablets, all absolutely free. Desmos is a fantastic online graphing software (no need to download anything, works straight in the browser), that is very intuitive to use. Students usually find it easier than the other graphing softwares, but this ease of use means it has significantly less features (no transformations, geometry or 3D, just graphing). Having said that, what it does, it does very well. They also have a selection of free to use premade lessons, which actively promote students playing around with maths. There is also an independent site called Daily Desmos which produces two graphs every day for you to show your class, and they have to try to reproduce them in Desmos. Tarsia is a free piece of software from Hermitech Laboritories that generates puzzles of various types (including dominoes and hexagonal). All you have to do is enter the question and answer, and it will jumble them up into a working puzzle. Great for a hands-on approach to practicing maths, a must have for any classroom. Also available are a selection of pre-made puzzles as described above. 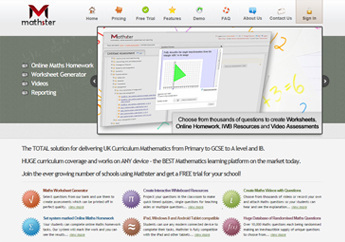 MyMaths.co.uk provides a whole selection of online lessons and worksheets. There are two subscription types. The single user gives a single login for staff and pupils, to access all the materials. The multiple user gives each student a personal login, and allows teachers to set online homeworks, which MyMaths immediately marks and gives feedback to the students. It also produces a full report on the classes work on each homework, allowing teachers to use the data in future planning. Definitely worth a look, if you don't already have it in your department. Below is an excellent padlet put together by @missradders, which includes some more fantastic websites worth a look.